It has been a busy summer of gathering materials, weaving baskets, teaching workshops, and preparing for the opening of this show. Below is the press release. I am looking forward to sharing my recent artwork with the community and the world. If you are local to High Falls NY or the surrounding area it would be wonderful to see you there! High Falls, NY—On Saturday, August 5, Wired Gallery opens Woven Spaces, a solo exhibit of works by Katie Grove, with a reception 5:00-7:00 p.m. sponsored by Stone Ridge Wine and Spirits. The show runs until Sunday, August 27, 2017. A desire to observe nature closely and share what she discovers is what drives Hudson Valley artist Katie Grove. Her perceptive drawings, etchings, and mixed-media sculptures highlight the unseen and intricate details of the natural world. 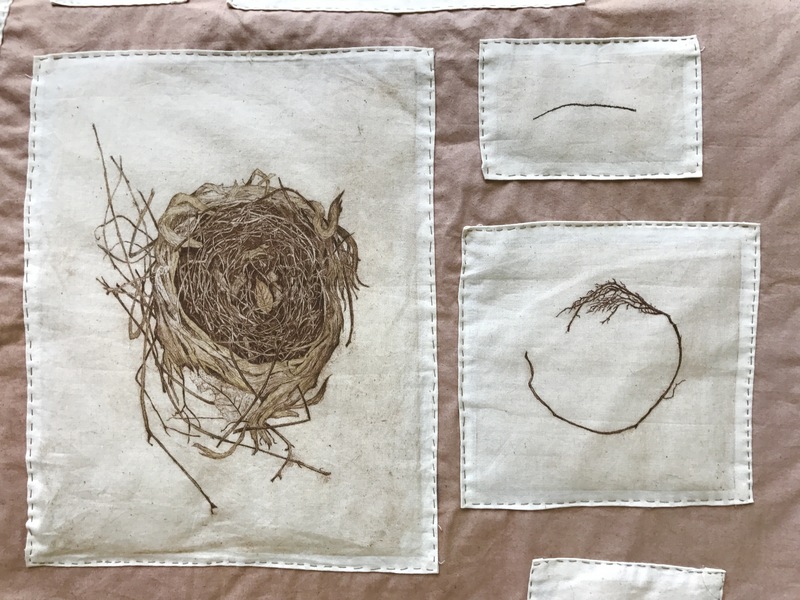 From meticulous drawings of the hundreds of pieces in a bird’s nest, to woven sculptures, which ask the viewer to look closer, her work has a strong sense of exploration and storytelling.She takes the perspective of a naturalist and an artist, creating pieces that aim to be both scientifically accurate and imaginative. 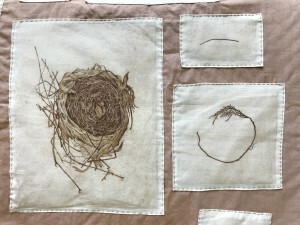 The work in this exhibition spans several years of her career and includes her Language of the Nest series, work created while in residency at Women’s Studio Workshop, recent work in basketry and woven sculptures, and a selection of watercolor paintings from her Medicine Feathers collection. All are inspired by natural objects and elements of nature found in the landscape near her home in Rosendale, NY. “I want to make art that is a love letter to the earth,” says Grove. In Woven Spaces she invites the viewer to stop and listen–to appreciate the simple beauty that each precious element of nature has to offer, whether it is a length of woven grapevine, a single rootlet, or an individual bird’s feather. Grove has a BFA in Printmaking from SUNY New Paltz, but she also draws from her background in book arts, watercolor, basketry, and textile techniques to create a wide range of work. 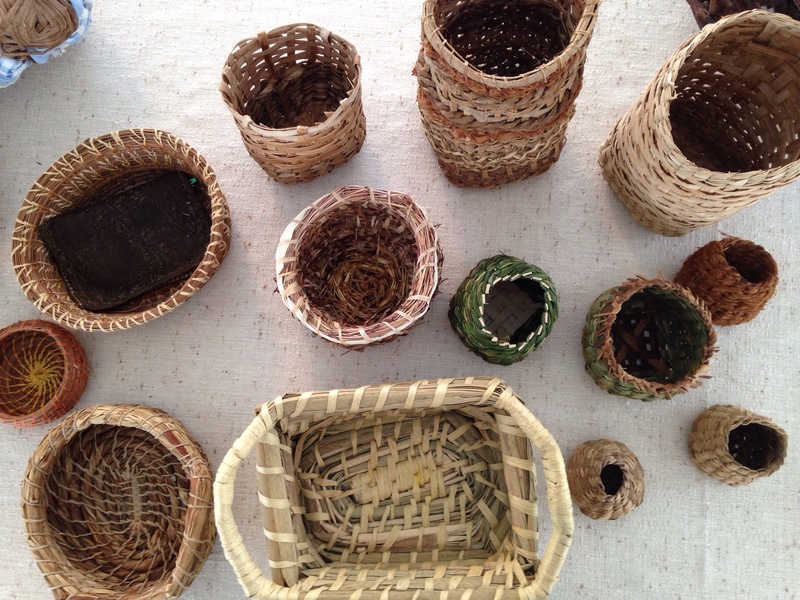 She exhibits her artwork regionally and teaches workshops on art techniques using natural materials, including basketry and plant dyes. 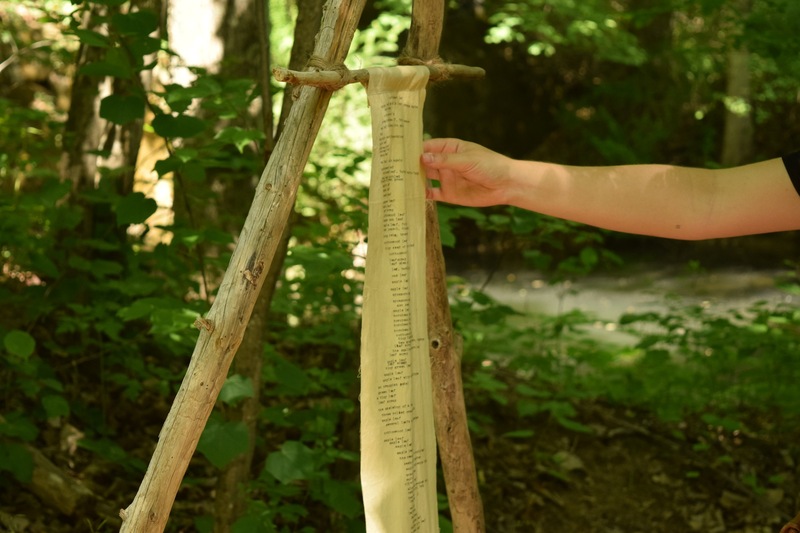 She is a recipient of the Ora B Schneider Regional Artist Residency at Women’s Studio Workshop and was awarded a 2017 Residency at Instar Lodge. No matter which medium she explores, her work always reflects an appreciation of the natural world and tells a story about our relationship with it. 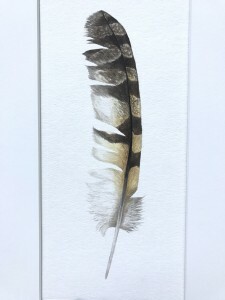 Medicine Feathers is an ongoing series of realistically painted watercolors of bird feathers. In them I strive to capture the minute details of the pattern, shape, and color of each individual feather from dozens of bird species. As a naturalist I aim to maintain an accurate depiction, while still giving the feathers soul and feeling. Each one is truly unique and framing them in repurposed antique and vintage frames adds to this sense of individuality. 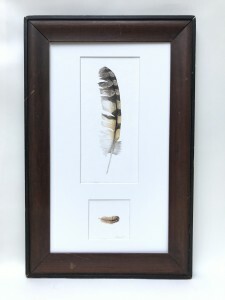 Many of the paintings in this series are commissions and I find that each request for a painting of a specific type of feather comes with a story. It may have been found on a special occasion or represent a bird that has some special meaning to an individual. To me and so many others birds are messengers, filled with meaning if we are able to listen and look closely. 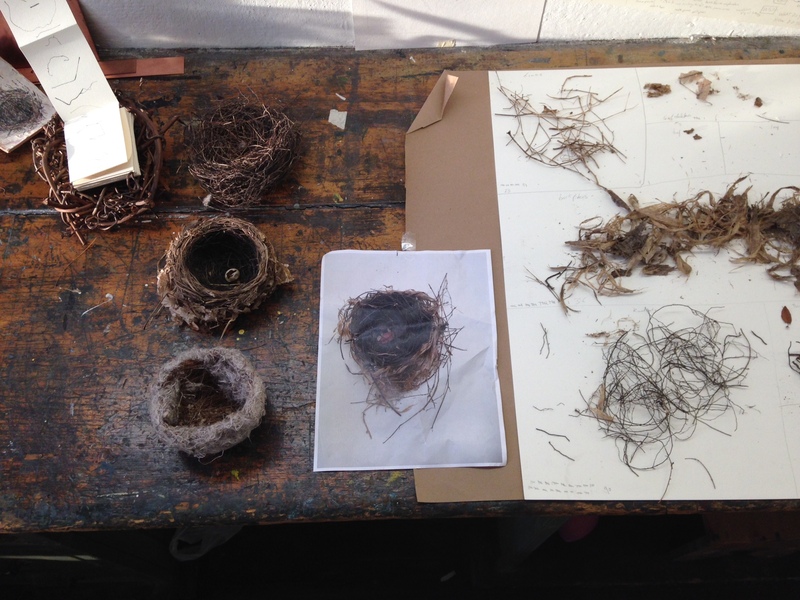 In Language of the Nest I carefully deconstruct entire birds’ nests and draw every piece of the hundreds of twigs and rootlets. In this process, the beauty and uniqueness of each individual piece becomes strikingly evident. The greatness of the task undertaken by the bird also comes to light and in the process of creating this work, I find myself paying tribute to the bird’s diligence, obsession, and attention to detail. The nest pieces laid out next to each other bear a striking resemblance to the characters of an unreadable, yet incredibly compelling language. In considering this comparison to language, themes such as discovery, searching for answers, and attempting to understand worlds other than our own are evident. In a time when connection to the natural world is paramount, the process of seeing and appreciating the hundreds of unique fragments in one nest also serves to connect us to the experience of the bird’s life. In my newest work I am creating baskets and woven sculptures that give voice to the plant species used in each piece. 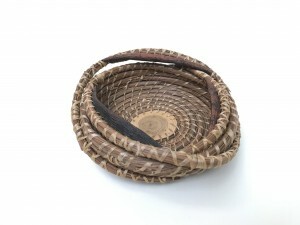 In some, phrases and words are embroidered and woven into the baskets as if they grew there naturally. In other pieces, I aim to highlight the unique and beautiful qualities of each material by utilizing them in sculptural forms. As I ask myself what I want to communicate on the plant’s behalf, messages such as “look closely” and “listen and hold space” emerge. From the time I spend harvesting the them to the time I spend weaving them, working with the plants is a collaboration. As I get to know plants such as white pine, grapevine, honeysuckle, their individual qualities began to stand out. 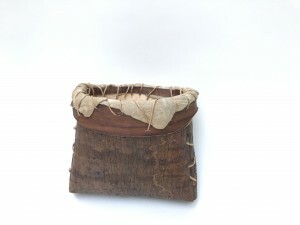 Some plant materials work best as a random-woven vessel while others prefer to be folded and sewn, allowing a range of weaving techniques throughout the series. This work is the result of my desire to go deeper into making art with plant materials and to connect with the root of why creating art with locally harvested plants is important. High resolution pictures available. Please don’t hesitate to request. Thank you.